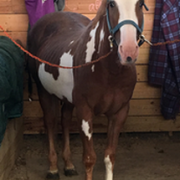 Waylon is paint gelding who came in during Sept. 2016 Stearns County humane case. He was foaled in approximately 1998. He was a stallion at intake and had spent several years locked in a filthy closed up barn with no turnout at all. 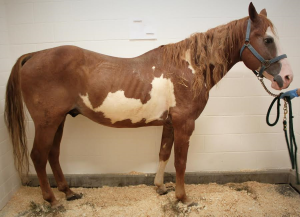 Because of these conditions and lack of hoof care, Waylon showed signs of laminitis at intake. He is currently being treated for this with regular farrier care and front shoes and is sound. Waylon is a sweet horse with good ground manners. He is not broke to ride. 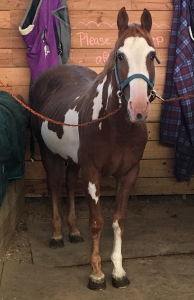 Please consider giving this sweet horse a good home–he deserves it!